In 1977, former President Richard Nixon agreed to sit for a series of interviews with British talk-show host David Frost. The interviews covered every aspect of his presidency, and the final session discussed Watergate. In this session, Nixon admitted his mistakes and illegal activities and apologized to the nation. The interviews attracted the largest audience in television history up to that point and remain today the most-watched political interview of all time. That’s the history; Ron Howard’s film Frost/Nixon examines what went on behind the scenes, especially the motives of the titular characters. The film is 2 hours of characters exchanging dialogue, and yet it is one of the most riveting films of the year because of how vividly it illustrates what was on the line for both men. Nixon, disgraced after his resignation, wanted to win America’s trust back, while David Frost wanted to gain credibility as a TV figure and regain the fame he had previously experiences in America. For Frost, this goal eventually became even more ambitious; he and his team wanted a confession from Nixon and give America closure with the turbulent political atmosphere revolving around Nixon’s final weeks in office. But how could he? Frost was a talk-show host, a TV personality who could never conceivably stand up to the likes of Richard Nixon. Most audiences will know the outcome of the story, but Frost/Nixon examines the steps that led up to the climactic confrontation between the two, and it’s an absolutely fascinating story. Screenwriter Peter Morgan (adapting his own stage play from 2006) has created a story that gives viewers an up-close and groundbreaking look at the interviews; the story emulates that of a boxing film. In the film, David Frost is the underdog and Richard Nixon is the champ, and only one can win. Everything surrounding the interviews (the match) is riveting, but when the two adversaries face the camera (or in another sense, enter the ring), that’s when you’re on the edge of your seat; everything else is just build-up. The acting is absolutely spectacular. Frank Langella portrayal of Nixon is one of the best performances I’ve seen all year, and if I had my choice, I’d give him the Oscar for Best Actor. Langella isn’t doing an impersonation of Nixon; he’s embodying the man, and gives us a three-dimensional view of the former President. He’s smart, arrogant, charming, conniving, and ultimately, remorseful. Langella nails Nixon’s softer moments, like a recitation of an anecdote, but the he really hits a home run when he’s giving a passionate speech; a scene where Nixon calls Frost late at night contains a forceful speech about how people of a higher social class can’t stand men like him or Frost, and Langella’s acting here will blow you away. 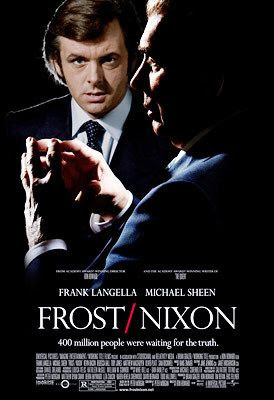 The real trick is that, when Frost finally gets Nixon to commit to Watergate, you will cheer for Frost’s victory for a moment before Langella’s acting makes you feel incredibly sorry for Nixon. Ultimately, Langella says more with facial expressions than he does with words, and in a glance you can feel Nixon’s sorrow, remorse, and isolation. Langella played Nixon in the stage play, and Michael Sheen also reprises his role from the play as David Frost. With Langella’s powerhouse performance, it’s easy to overlook the other actors, but Sheen deserves immense praise as well. He makes Frost into a terrific protagonist that the audience can root for until the end, and Sheen absolutely nails the interview scenes. Sam Rockwell also stands out in his role as James Reston Jr., one of Frost’s “crack-investigators” who finds a key piece of evidence to implicate Nixon. Kevin Bacon is powerfully cold as Nixon’s chief of staff. There are plenty of other actors and actresses who deserve mention as well; in a dialogue-driven film, the actors carry the picture, and in Frost/Nixon, they do so with gusto. Hans Zimmer’s score isn’t necessarily amazing, but it does deserve mention as a personal achievement for the composer. Zimmer is known for his huge, bombastic scores and we all love him for it, but I’ve never heard anything subtle from him. Surprisingly, the best word to describe the music in Frost/Nixon is subtle. The music usually acts as a sort of background noise to add tension to a scene, almost like music in a thriller. But Zimmer’s score shines brightest in the quiet, emotional themes he’s composed for Nixon; combine his music with Langella’s acting and you’ve got some powerful shots. Frost/Nixon is a huge achievement for everyone involved; it’s Ron Howard’s best film since Apollo 13, a compelling and powerful movie that tells an immensely fascinating story. It’s the best historical film I’ve seen all year, one that goes beyond a simple recreation of events and analyzes the characters, managing, through a mix of fact and fiction, to humanize Nixon in a profound way. It works as a piece of history, a character study, and a dialogue-based thriller, with humor thrown in at various places along the way. Frost/Nixon is one of the year’s best films and comes highly recommended.